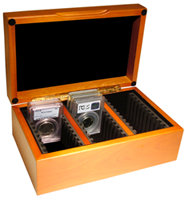 This is the big daddy of all Guardhouse coin slab display boxes! Designed to universally hold up to thirty NGC or PCGS sized coin slabs, this wooden coin display box from Guardhouse not only looks impressive, it helps keep your coins organized and protected. Built with thirty individual dividers, coin slabs are stored in three rows of 10 and prevented from rubbing against each other. A proper amount of space between coins allows for easy removal and viewing. The Guardhouse name is synonymous with quality and this Guardhouse coin display box is no different. Built from quality wood with sturdy golden hinges it has a classic styling that allows this box to be displayed in any room.